Supplier relationship management (SRM) is vitally important to every organization. If managed in the correct way, suppliers can have a hugely positive impact on a company’s growth. They provide materials, machinery, expertise and services, amongst other things, that can reduce costs, boost efficiency and improve quality. However, suppliers can equally cause many problems in the form of bottlenecks, delays and extra costs if not managed in the correct way. Strained relations within the supply chain are usually brought on by a mixture of poor visibility, co-operation, and frustration, from both the supplier and buyer. It is therefore extremely important that supply chain managers assess the risks involved prior to contracting out business. Supplier compliance needs to be positioned at the forefront of your SRM strategy so that the organization’s procurement team are given the correct tools with which to work. 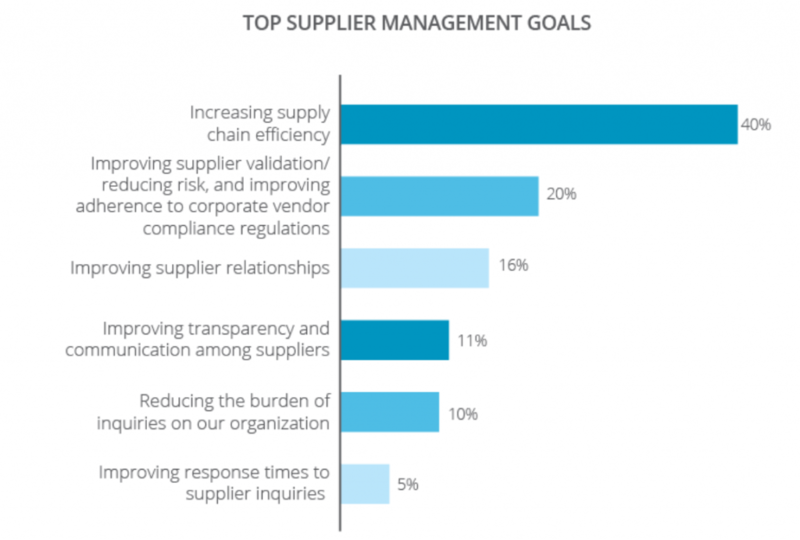 The graph below by Paystream Advisors displays how highly SRM professionals rank supplier validation, risk reduction and compliance amongst their most important supplier management goals. There are three key steps that all supply chain managers should take in order to achieve supplier compliance at all stages of an organization’s supplier relationship management process. 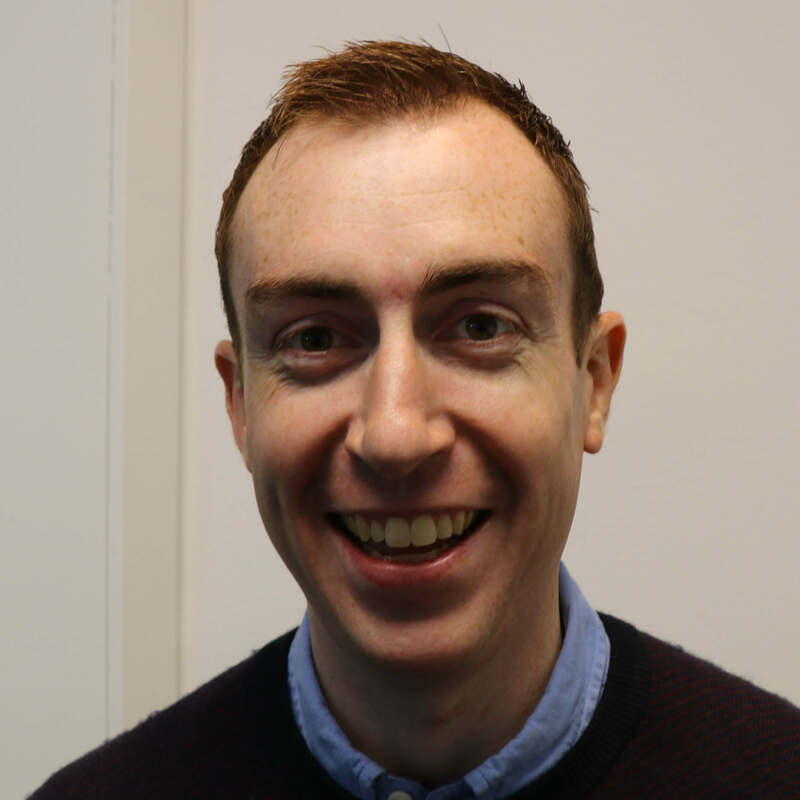 The fundamental question to be asked, when carrying out an assessment of a potential supplier’s capabilities is if they can continually maintain a high quality of service? Ensuring that your own company’s standards are not compromised is essential. From this overarching question, specific information should be gathered regarding the likes of pricing, experience, capacity to deal with orders and financial stability. If any of these are lacking, supplier compliance is likely to be affected at some stage. Pre-qualification questionnaires should be used to assess potential supplier capabilities. These questionnaires should be tailored to gather information specific to the goods they are supplying or the services they are providing, rather than using a generic approach. Finally, any suppliers that have been deemed viable options and subsequently fully authorized, should then be used by all departments within your organization. Sometimes other departments may choose to use non-approved suppliers for a simple reason such as them being cheaper. However, the risks associated with using a non-approved supplier may prove costly in the end. It is important to maintain strong and regular communication with each of your suppliers after entering into a contract with them. By keeping them up to date on strategies and plans, suppliers will be able to assess how they fit in and how they can add further value. Relationship management of this nature should act to encourage supplier compliance, without you having to carry out checks. However, it is also very important to set clear rules and policies with suppliers from the outset. Suppliers need to understand exactly what is expected of them and what actions could cause them to be ‘non-compliant’. Organizations should look to formalize requirements through the creation of official contracts that suppliers are bound to. Details need to be recorded and measured to safeguard against the possibility of suppliers not completing their required duties in a timely manner. Controls and restraints should also be included in supplier contracts so as to ensure they carry out the work expected of them and don’t abuse their position within the supply chain. A positive start has been made to an organization’s relationship management with a particular supplier if a thorough assessment has been carried out and a clear and detailed contract of agreement has been put in place. However, in order to ensure supplier compliance for a sustained period, steps must be taken to monitor suppliers regularly. Spot checks should be carried out to show suppliers that you have both a knowledge of and interest in what they do. These should also prevent suppliers from being lulled into a state of complacency and remind them of exactly what they are responsible for. As well as conducting spot checks, official audits should also be carried out. Key performance indicators should be used to measure the strength of all supplier relationships and performance. 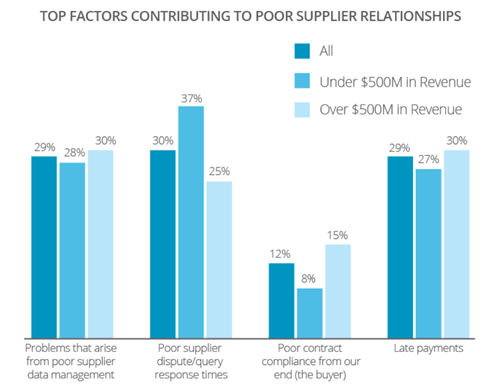 In a recent Paystream Advisors survey, 29% of organizations listed poor supplier data management as a contributing factor to poor supplier relationships. Metrics need to be gathered, measured and analysed to assess whether or not the desired outcomes and objectives were achieved. This process can be made a lot easier and informative by leveraging technology that will automatically track these stats. Procure-to-Pay Automation and SCM technologies provide access to a portfolio of suppliers segmented by the likes of type, risk level and region. Many platforms can even add automation and added transparency in areas such as data management, PO and invoice tracking, for both the supplier and contractor. These smaller improvements will all contribute to improved supplier relationship management. Supplier relationship management can be a difficult process. If you prioritize supplier compliance it will become a lot more straightforward. By strategically carrying out this three-step process and investing in technology for automation and visibility, your organization will ensure that you get the best possible service from your chosen suppliers.